Discover Santoro's Gorjuss in a whole new setting, with the Gorjuss Christmas collection. For the first time ever, you'll find the 'gorjuss girls' in a variety of wintery environments, with snuggly bobble hats and festive jumpers, surrounded by classic Christmas icons. 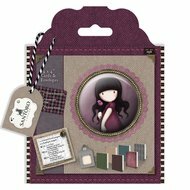 Add some easy embellishment in Gorjuss style, with this pack of 4 craft tapes. Complete with a handy perforated cutter, you'll find two 'gorjuss girl' designs plus gold glitter and classic Christmas holly.